The lack of third-party data in China combined with lax personal data-use laws has resulted in unique and innovative workarounds. Demand for personal and real-name user data in China has long outstripped its availability, so the industry has evolved unique methods of coping. Third-party data remains thin on the ground but China’s three internet giants — Baidu, Alibaba and Tencent (often referred to as the BAT) — have risen to dominate the landscape as consumer data providers. Tencent, thanks mainly to WeChat and its weibo platform, is the leading source of social data. Baidu collects search and traffic data, and has launched several laboratories to mine the information including the Beijing Big Data Lab and the Deep Learning Institute. Alibaba’s Open Data Processing Service analyses the millions of transactions taking place on its e-malls and payment systems. To get their hands on this information, China’s agencies and marketers rely on exclusive partnerships with the three big publishers and the BAT have moved to capitalise on demand. 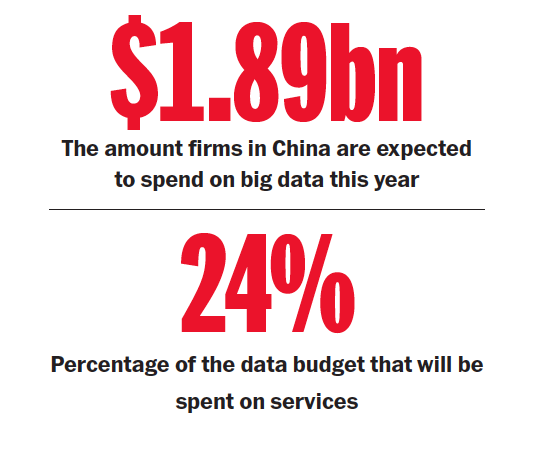 According to data from the China Academy of Information and Communication Technology (CAICT), spending on big data hardware, software and services is this year expected to jump 38 per cent from last year to Rmb11.59 billion (US$1.89 billion), reports eMarketer. One quarter of this sum (24 per cent) is spent on services. SMG has struck a data partnership deal with Tencent while digital agency group Hylink has agreements with Alibaba and Baidu. Hylink’s deal with Alibaba, for example, gives it access not only to the company’s shopper data but also to its display advertising inventory. While the BAT holds sway over China’s digital data sources, its siloed nature has given rise to players such as Miaozhen and Hylink that work to connect data sources. In Hylink’s case, the firm is working to build a user “SuperID” which combines not only online behaviour but the user’s phone number and unique device identifier. While anonymised, the data is still linked to a real person — something that can be difficult in China’s bot- and fraud-ridden online world. Referred to in China as ‘water armies’ or ‘zombies’, they’re known to flood the internet with fake comments, followers and clicks. To achieve this, Hylink’s mobile marketing arm WizAd uses an internal system that cleanses data, identifies the unique person and tracks their social activities, behaviour and attitudes. “We are helping our clients build private management platforms — PMPs — to replace traditional research. This is far more accurate because it’s not based on a sample or focus group. It’s a panel that identifies unique customers,” she says. One client Hylink is building a PMP for is dairy giant Mengniu. “For example, we’re able to help them make management decisions when it comes to new product development. Using geo-data, we can pick up patterns that will prove the product works,” says Cassumbhoy. As the industry evolves from understanding what can be done to what should be done, China’s laws are catching up. In March this year, China’s State Administration for Industry and Commerce (SAIC) started bringing in measures to protect personal data. “To use any data collected in terms of name, gender, job, date of birth, health status, consumption habits and so on, you must observe the principles of lawfulness, rationality and necessity,” says Haswell. “They may not be fully conscious of the use of targeting, but they expect offers and coupons to reach them seamlessly no matter if you’re shopping online or offline,” she adds.